As throws go, the plaid pattern is classic. You're probably familiar with the ones from Pendelton, with their manly palettes and renown durability. But I'm an even bigger fan of these ones above from Avoca, an Irish company. Their colors are cheerier, and their overall sensibility is a bit more feminine. Plus, for a blanket of this quality, they're very well priced. 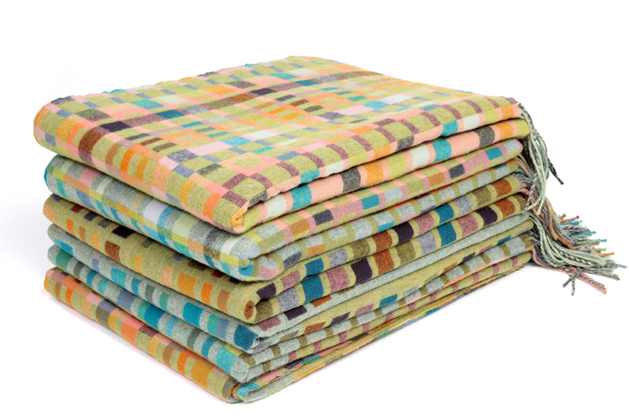 I really like this spotted throw from English company Bronte. It's not always easy to make polka dots sophisticated, but this blanket manages to do just that. The bright colors combined with the pale gray make it feel modern, too. I adore this blanket from Dutch textile artist Mae Engelgeer. It's made of a blend of mohair, cotton and merino wool, a material developed at the Textile Museum in Tilburg, The Netherlands. And how cool is that echo of the snowcapped mountain range? It would be right at home in a stylish cabin, or in any home hoping to capture that style. 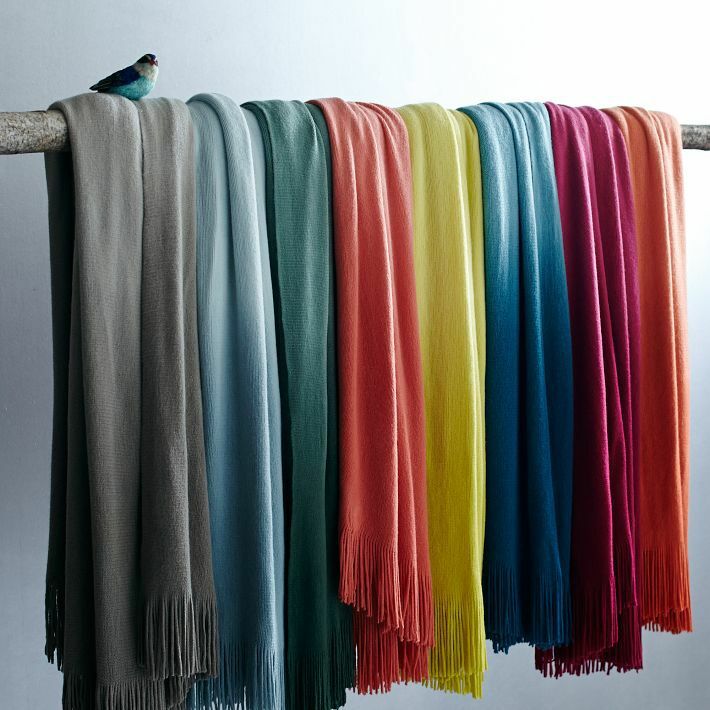 The ombre throw from West Elm comes in a bevy of pretty shades. Plus, the whole ombre/watercolor thing is very trendy right now. They're inexpensive, so don't expect heirloom quality. But for a pretty pop of color and a soft hand, they're a really nice option. I love a good stripe, and these are particularly fun. The blankets are made of alpaca, which means they're not only incredibly soft, but also hypoallergenic. They're made in South America by Shupaca, a company dedicated to both fair trade practices and economic advancement for their local artisans. These blankets from Scottish artist Donna Wilson are such a kick. You can see echoes of traditional Welsh patterns in there, but their palettes make them decidedly contemporary. They're expertly woven in a historic mill in Wales, using wool spun and dyed in England. They're double-woven too, so they're sure to be extra warm. Check out the gorgeously delicate geometry on this Isoline blanket! It's fashioned from wool and nylon, which gives it a beautifully light drape. It would look very chic slung over a trim leather sofa. I wrap with this amazing throw from British artist Holly Berry. It has that hip geometric thing going on, and it's colorful without being wild. But its coolest feature is a bit hidden: the graphic pattern spells L-O-V-E in Morse code. How fantastic is that? The gift of love wrapped up in a cozy blanket: I can think of no better gift to give this holiday season.